We just love these colors together! 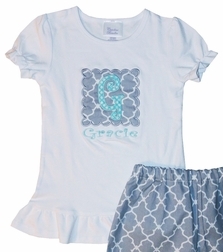 Here we take one of our cute white ruffle girl's shirts and applique it with a scalloped patch in grey quatrefoil or chevron itself appliqued in Curlz turquoise dots fabric with your little one's initial. The name is embroidered underneath the applique in the same blue color to match the dots fabric. 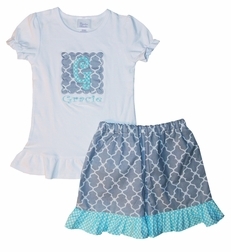 The shorts/capris are made from the same grey fabric and are trimmed at the hems with the gorgeous turquoise dots fabric. We just can't get over how wonderful these colors look together-sweet yet chic!